Unbelievable as it is, the Palestinian leader, Abbas, couldn't be coming to the peace table in good faith. This Palestinian Authority Chairman, Mahmoud Abbas, recently stated that there would not be a single Israeli Jew living within a future Palestinian state, so he's planning on kicking out all the Jews and having an Apartheid state. He's been saying this for some time, now. On the PA TV broadcast was heard that the PA state's boundaries would stretch from Rosh Hanikra to Eilat. This is stretching from Israel's NW corner to its southern tip. This goes along with the maps they have made showing Israel's name deleted and replaced with "Palestine." It is what they teach their children in school. Such a thing has never been in past plans during the Oslo conferences. This is pie in the sky that they are reaching for. In my experience in the shuks, the seller asks for an outrageous price and the buyer responds with a ridiculous low sum. The finagling goes on till they reach a happy medium that both can live with. I don't think this is the case. It could be that Abbas really expects to get what he demands. The way everyone fawns over him, no wonder he expects the whole gontzeh megillah. All the attention he has received just to sit down, finally, does not lead to a healthy peace discussion! I've been saying that they want all of Jerusalem, not just the eastern section, and then they'll want all of Israel, and if I know it, surely the Knesset members also know it. This comes from reading their Hamas charter that Fatah seems to be in agreement with since it's also in the Muslim Brotherhood charter. It's too bad that we didn't ask for conditions as a preamble to sitting down this time such as ending the brainwashing of the people to be hateful towards Israel and show what they're doing to end it. Israel is sitting down before such a thing as their recognition as a state is accepted by the Palestinians, and if it ever was, they have a funny way of showing it. So much for expectations of honesty and truthfulness. Another Palestinian TV broadcast was an anti-Semitic program making violence against Jews in Judea and Samaria legitimate. They called the Jews living there "violent thieves." They are talking about land that was a part of the Jewish Homeland decreed by the League of Nations on July 24, 1922 and signed by all the nations of the world as being the future Jewish state. Then they charged Britain with the mandate and they were to see that it was carried out. The thieves were Jordanians who grabbed it in 1947 which was against the law. But then, who upholds the law for the Jews? Israel was accepted by the UN but attacked by the UM-united Arab Muslim irregulars who attacked first after November 29, 1947 from Syria, Lebanon and Egypt. Then about an hour after announcing the creation of the state on May 14, 1948, the regular armies of Egypt, Transjordan, Iraq, Syria and Lebanon and a Saudi-Arabian contingent attacked. That's when Azzam Pasha, head honcho of the Arab League said from Cairo that this would be the war of extermination and a momentous massacre which will be talked about like the Mongolian massacres and Crusades. However, they lost the battle and Israel has survived for 65 years against people with a mindset like this! What Israel regained in the battle of 1967 when, like a pack of dogs, all the Muslim neighbors attacked Israel who turned out to be the winner, much to every Muslim country's surprise, was land that was theirs in the first place! Israel in fact got their own land back in that bad gamble on the Muslim's part. The end of this nasty programming showed a religious Jew with peyote (side curls) by the ears cut them off. This was a copy-cat scene of anti-Semitic Nazi propaganda. Broadcasts of incitement during Ramadan, which just ended, was a re-run of a music video encouraging violence against Israelis. I ask if this is the type of religious holiday that asks for this type of thing? They also included the glorification of murderers of 61 Israeli civilians on their Facebook page of Abbas' Fatah party. Most civilized countries today just do not do such things. With so many acts of incitement by the Palestinian leader himself, Prime Minister Binyamin Netanyahu sent a letter of complaint to US Secretary of State John Kerry Saturday evening. He told him that peace talks and incitement do not go together. If they want peace, they should be educating their people to live in peace with Israel. They have been poisoned against Israel which only encourages continued violence and terror. The carrot held out to Israel to be in these peace talks is the threat of diplomatic isolation if they do not reach a peace deal with the Palestinian Authority, Abbas. This cat came out of the bag when some top US officials met Thursday evening with a few Jewish community leaders asking for their support for the diplomatic talks between Israel and the PA. So Israel's arm is being twisted by other Jews as well from the USA if they succumb to this threat. 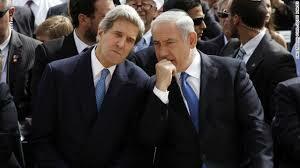 It also sounds like Kerry is saying that the USA won't back Israel if they aren't compliant. He has to be already siding with Abbas, then. 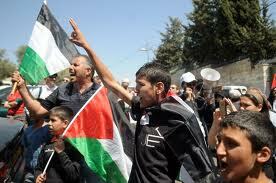 Israel is under terrific pressure while there is none on the Palestinians. What a deal! How else would the USA have the chutzpa to expect Israel to give up murderers of many out of prison; something they most likely would never agree to, themselves? The talks are to continue this week by meeting in Jerusalem on Wednesday and Jericho the following week.